1. 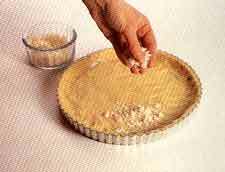 Prepare the pastry as before and line a flan dish with a removable base. 2. 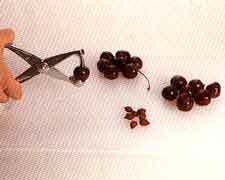 Wash the cherries and remove the stones and stems. Cut them in half to remove the stones easily. 3. 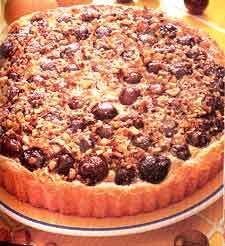 Sprinkle the top of the pastry with the bread crumbs and then spread the cherries over evenly. Sprinkle with sugar and a pinch of nutmeg if desired. Scatter over the hazelnut. Beat the egg yokes and cream together and pour over the top. 4. 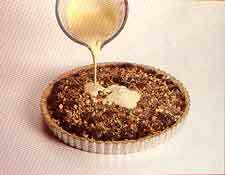 Bake in a preheated oven at 200 degrees Centigrade for 20-30 minutes or until the pastry is pale brown and the filling has risen and set. Serve warm or cold cut in two wedges. Variations: Other berries may be used instead of cherries. If using canned fruit, be sure to drain well. Cooks Tip: This cake does not keep well, so serve on the day it is made.